Wisconsin could have new legislative Assembly districts in place for the 2018 elections. Under an order issued Friday morning by a three judge panel in Madison, the state is barred from using the current district maps in future elections. Lawmakers were also told to have a new version in place by November of this year. The order follows a previous decision by the court that found Wisconsin’s current legislative district maps as unconstitutional. Groups challenging the district lines drawn in 2011 argued Republicans drew them in such a way that reduced the influence of Democratic voters. The state is expected to appeal the original ruling to the U.S. Supreme Court. A spokesman for the state Department of Justice said they are currently reviewing today’s order, but they do expect to appeal it as well. Democrats praised the ruling, and argued that the process of drawing new maps should be done in public. “What we cannot and will not tolerate is another map drawn behind closed doors. 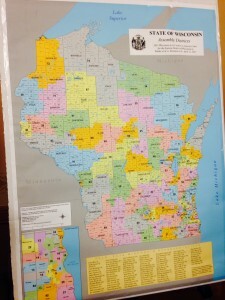 A new map should be subject to public hearings in different parts of the state to ensure that voters are choosing their representatives, not the other way around,” argued Assembly Minority Leader Peter Barca (D-Kenosha). “Rather than trying to justify their unconstitutional election rigging efforts, Republicans should work with Democrats to protect voters and restore election fairness,” said Senate Democratic Leader Jennifer Shilling (D-La Crosse). Republican leaders in the Legislature were either unavailable for comment or referred questions to the DOJ. A spokesman for Governor Scott Walker said they believe the maps are constitutional and do plan to seek a prompt review by the Supreme Court.